The Accu-Ssage™ Therapy seat is a customer favorite, offering a deep, full-body immersion experience. Carve out space and time for yourself in the Cambria. With CLEARRAY® UV-C Technology + Filtration system, water is treated with the power of nature-inspired UV-C technology to neutralize waterborne pathogens, resulting in clean, fresh water. 880™ MicroClean® Ultra Filtration System with horizontal MicroClean® Ultra Filter, SlipStream™ weir, Dynamic Flow™ Circulation Pump and CLEARRAY® system. The lighting and waterfalls feature Multicolor SunGlow™ LED’s that brighten-up the spa interior, AquaTerrace™ waterfall, footwell and backlit grab bar. 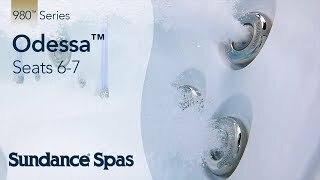 The controls are on an advanced i-Touch Control Panel that amplifies ease of use with a glowing, color touchscreen control and icon-driven menus, so programming your spa is easy day or night. Compatible with optional SmartTub™ System. This Sundance 880 Series spa gives you the luxury of a private retreat, perfect for enjoying warm moments. You will relish any number of types of massage options – . soothing, calming, invigorating. You set the mood inside the spa and the Cambria creates the atmosphere. 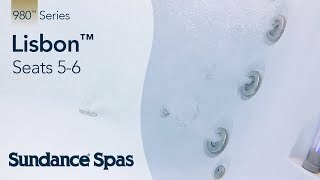 Sundance always offers a superior at-home spa experience with a blend of design and technology that offers true comfort. It is the ultimate in relaxing hydrotherapy. 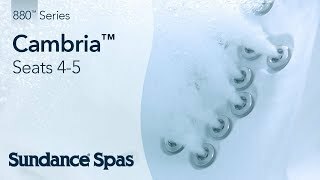 Relieve the stress of your day, rejuvenate your body and put your life back in harmony with a Sundance Cambria Spa from Carefree Spas of Indianapolis.